OK. . So everybody knows the story already. 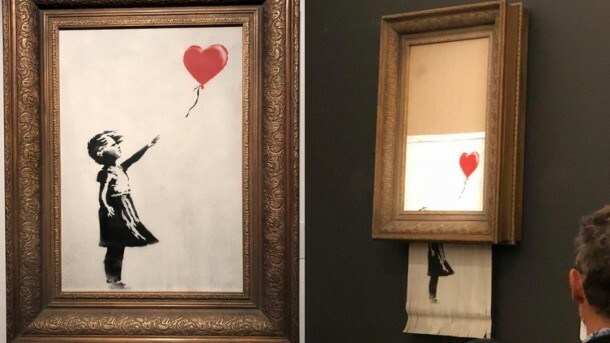 Banksy sold the piece „Balloon girl“ years ago and to teach any guy a lesson who would come up with the artwork on the secondary market, like an auction house, he installed a shredder in the frame he sold the piece in. Well, after Banksy gained world wide success and his prices started to sky rocket it finally happened. The artwork went to Sothebys and just after the hammer fell at 800.000 GBP, the machnism in the frame started and the artwork got shredded. It´s a great story and everybody loves it (including myself) , shares it, talks about it … and very very soon (in the very near future) the shredded artwork is one of the most famous artworks on planet earth. So in the end Banksy did not teach the seller and the buyer of the piece a lesson that art should not be an object for speculation and investment, but in contrary, he did those guys (especially the seller) a big favor. The artwork is not completely destroyed and in the state it has, it is definetly worth way more now than the 800.000 GBP it was sold at Sothebys. After all it´s a little suspicious that the mechanism of the shredder needs some energy, in this case a battery or something, which is still alive … after how many years. (Would love to have some of these.) Just to remember . The piece „Balloon girl“ was originally made in 2006. Not to mention, that the artwork itself looks a little different from the other „Balloon girl“ pieces that showed up (check the arm of the girl and the shading on the balloon). The officials at Sothebys kept amazingly calm, when the shredder started…. and so lucky Banksy had one of his partners, or might he be even there himself, to start the mechanism by remote. Veröffentlicht in contemporary art, Installations, street art, urban artBookmark the permalink.